Police moved in on student protesters gathered near McGill University, during a planned demonstration against tuition hikes. Four people were injured during student protests over tuition-fee hikes as clouds of tear gas wafted Wednesday over downtown Montreal. All the injuries were minor, although two of the people – one police officer and one protester – were whisked to hospital by ambulance to be treated for trauma. Students converged Wednesday on several provincial buildings, including the liquor commission and the education minister's office, and they momentarily attempted to occupy the Loto-Québec headquarters which is home to the organization representing university rectors. Helmeted and shield-wielding police charged a line of students near the Loto-Québec headquarters after they pushed down a row of metal barriers. Several students were arrested, some tackled by police who fixed plastic ties around their wrists before hauling them away. The boom of volleys of tear gas echoed through the street as riot-squad officers laid down a curtain of gas among the protesters, sending many stumbling away coughing and rubbing at their eyes. Some protesters apparently gained a brief entry at Loto-Québec headquarters but were moved out. Others jostled a row of police bicycles, while some tossed objects at officers. Students are protesting tuition increases pending later this year. (Alison Northcott/CBC)The melee was eventually brought under control with lines of police facing mobs of protesters across Sherbrooke Street, one of Montreal's main east-west arteries. Barriers and debris littered the street and a Quebec provincial police helicopter soared above the scene tracking the mob's movements. Another group of students broke away and headed along nearby Ste-Catherine Street, the city's downtown shopping core, but no damage or ruckus was immediately reported. The students apparently tried to breach the Loto-Québec offices as part of a campaign of protests against higher tuition fees. 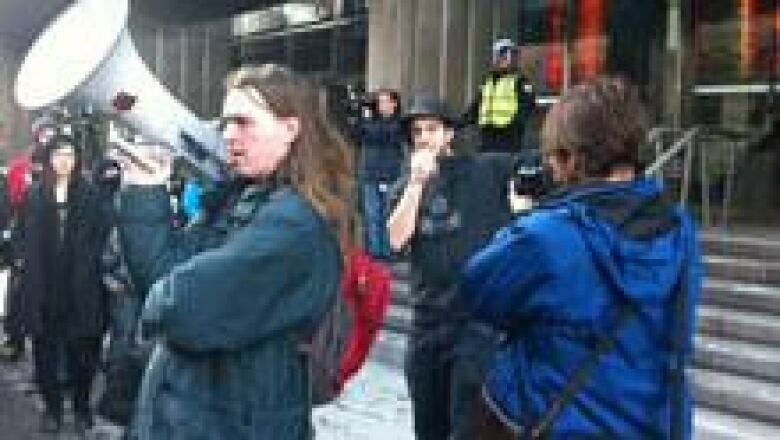 The scene in Montreal's streets illustrated the increasingly bitter battle over fees, pitting the Charest government against those who deem the province's rock-bottom tuition rates an inviolable principle. It also served to underscore the intense student pushback that has discouraged Quebec governments of the past from increasing rates, which have remained frozen in the province for 33 of the last 43 years as authorities either avoided or abandoned plans for hikes. Quebec's tuition rates for in-province students are the lowest in Canada, although students coming from other provinces pay higher rates. 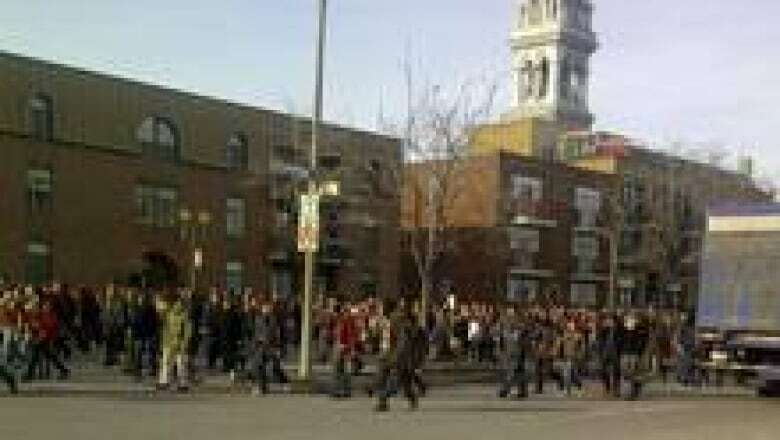 Students looped around downtown Montreal, ending up on René-Lévesque Boulevard . (Peter Johnson/CBC)The provincial government says its planned increases – at an extra $325 for each of the next five years – would still leave Quebec with some of the lowest tuition rates in the country at$3,793 per year. It says the new rates will help ensure the quality and sustainability of Quebec's universities. However, students protesting the hikes call it a question of values. They say higher fees will discourage some people from going to university, and argue that money to pay for better schools is available from other sources in Quebec. Tens of thousands of students have declared a strike and walked out of their classes in recent weeks. However, others have voted against taking such action. Premier Jean Charest was digging in his heels Wednesday. He described his government's plan as a reasonable and equitable way to keep universities competitive. "The real question is the quality of post-secondary education in Quebec. That's the issue," Charest told a news conference. "It's through taxpayers here ... that we're going to do the lion's share of fianncing of our universities and colleges. Then we're asking students to assume their fair share." Charest added that bursaries will increase at the same rate as tuition, to help poorer students: "So it's a fair solution," he said.